Treat yourself to a memorable private adventure of Iceland. Enjoy the stunning Icelandic nature from Northern Lights and the geothermal spa Blue Lagoon to the extraterrestrial views of the Glacier Lagoon and waterfalls like the Seljalandsfoss and Svartifoss. Set off on a total of three Northern Lights tours, including a during a boat ride, and visit outstanding unique locations such as the Diamond Beach. Welcome to Reykjavik - the picturesque capital of Iceland! Your driver meets you at the arrivals hall of the airport holding a sign with your name on it and transfers you to your centrally located hotel for check-in*. The rest of the day is free for you to enjoy the unsurpassed beauty of the surroundings on your own. Overnight in your hotel in Reykjavik. *Note: Early check-in prior to 3 p.m. is not included but can be pre-arranged optionally. In the morning after breakfast, you meet your private guide-driver at the hotel lobby and go on an amazing 3-hour city tour around the most significant places in Reykjavik and the nearby area. During the tour, you stop by the official residence of the President of Iceland called Bessastadir. Your next stop is Hafnarfjörður - a port town and municipality located about 10 km from Reykjavik. This place is known as the home of the "Hidden people" Huldufolk from local folklore, meaning elves in Icelandic. Then you proceed to the futuristic Perlan dome from which you see spectacular views over Reykjavik and its surroundings. You make a stop at Hofdi, the building where the all-important summit between the former U.S. President Ronald Reagan and the former U.S.S.R. Secretary General Mikhail Gorbachev took place in 1986. Then on to the Hallgrimskirkja Church that is the tallest building in Iceland where you have a chance to walk up the stairs to see the view of the city center (entrance tickets are not included). Another place you see today is the Althing building - a classical 19th-century building which is home to the Icelandic parliament's main debating chamber. In the evening you meet your guide-driver and set off on a 3-hour Northern Lights mystery tour. Today you have the chance to see the Northern Lights flashing across the sky in brilliant patterns and learn all about the Aurora Borealis. After the tour, you return to your hotel and have a free evening. After breakfast, you check out from the hotel, meet your guide-driver in the hotel lobby and head to the South Coast. On the way, you visit Seljalandsfoss, one of Iceland’s most famous waterfalls, and then the Skogarfoss waterfall. Next stop is Solheimajokull glacier tongue. A walk along the eastern path will take you very close to the glacier, a unique experience available only for guided tours. Along the way, you will be able to see the black Reynisfjara beach and have a stop at Vik, Iceland’s southernmost town, a fishing village where you have a break for lunch. Following a scenic drive, you finally approach Iceland's and Europe’s largest glacier, Vatnajökull and the Skaftafell National Park. Then you continue to the famous Glacier Lagoon. Here you can observe and photograph the lagoon and the icebergs, and maybe take a walk along the so-called “Diamond Beach”. After all the sightseeing and a day full of adventures, you arrive at the hotel for overnight. After dinner, you have another great opportunity for Northern Lights seeking, this time - over Iceland's Crown Jewel, the Glacier Lagoon. Following breakfast, you may relax at your hotel or join the optional tour to visit an Ice Cave. Sign up for one of the most amazing winter activities in Iceland and discover the hidden Kingdom of natural blue Ice caves underneath the biggest Glacier in Europe. After check-out and lunch, you have another chance to see the Glacier Lagoon and Diamond Beach in the bright daylight. After stopping at Fjallsarlon, a mini version of the Glacier Lagoon often with more, but smaller icebergs, and fewer tourists, you head back to Rejkjavik. Shortly after a break for coffee, you can walk to the beautiful Svartifoss, the Black Waterfall, a very impressive sight. Other beautiful waterfalls you see today from the road is the Systrafoss or the Sisters' Falls and the Urridafoss. 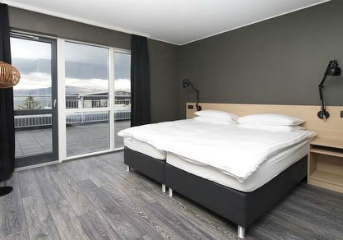 Upon arrival to Reykjavik, you check in to your hotel and have the evening at leisure. Today after breakfast, you continue your Iceland adventure with a relaxing visit to the Blue Lagoon - one of the most visited attractions in Iceland. You have some free time to soak up in the Northern sun while relaxing in warm geothermal seawater surrounded by a surreal lava field. In the evening you have a wonderful opportunity to enjoy the beautiful Northern Lights on board a comfortable boat. During the tour, your expert guide tells you all about the Northern Lights, the folklore, and superstition, and explains the underlying scientific facts that make this magical light show possible. The tour takes 2-3 hours. Warm overalls are included. After the tour your return to your hotel. Overnight in your hotel in Reykjavik. This is the final day of your amazing Iceland adventure. After breakfast and check-out your private driver transfers you to the airport for your flight back home. *Note: Late check-out is not included.